An iconic building now rests in the Christchurch suburb of Halswell. Part of the Christchurch rebuild the $22.5 million Halswell centre constructed by Fletcher Building is a multi-purpose community centre. The complex includes a 3050-square-metre library and community facility featuring a customer service centre, multipurpose spaces and a pool office and changing room areas. Customer service facilities and multipurpose spaces are being built on the existing Halswell Aquatic Centre site and adjacent land. The complex, fronting onto Halswell Road, will create a hub for the rapidly-growing Halswell community. To roof and clad this masterpiece Dimond® Roofing's new Heritage Tray™ machine was placed on top of a purpose built scaffolding tower playing a pivotal role in the Christchurch rebuild. The roof and walls play a major role in the complex build in terms of the aesthetics and rainwater management, but also provided a huge challenge to the manufacturer and roofing installer. Along with some very elaborate flashing details on the roof and walls that deliver both hidden gutters and completely concealed fixings, the longest sheet lengths are 26 meters. After several site meets and discussions around transport, the decision was made to design a specific scaffold tower and run the roofing on site, directly onto the roof. The tower and machine were regularly shifted as we moved to different areas of the roof. The roof & cladding on this job is the major visual aspect, it is a series of roof planes layered one after the other, each plane is set on a slightly different angle. The finished project will be one of the more architecturally inspiring and challenging jobs we have been involved with recently. Parts of the roof seamlessly turn into wall cladding and rainwater flows to ground level gutters. 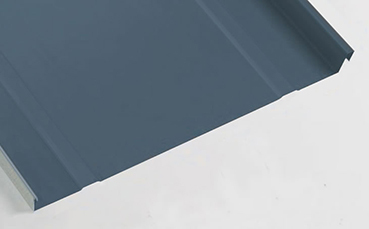 The barge flashings conceal a hidden gutter detail which carries water from the tapered sheets.